"Credibility, Integrity, and Transparency... These are our core values!" New vehicle pricing includes all offers and incentives. Pricing may not include dealer installed accessories. See your sales associate for details. Tax, Title and Tags not included in vehicle prices shown and must be paid by the purchaser. While great effort is made to ensure the accuracy of the information on this site, errors do occur so please verify information with a customer service rep. This is easily done by calling us at 256-830-6450 or by visiting us at the dealership. Pricing does not include Tax,Title, And $699 Doc Fee. 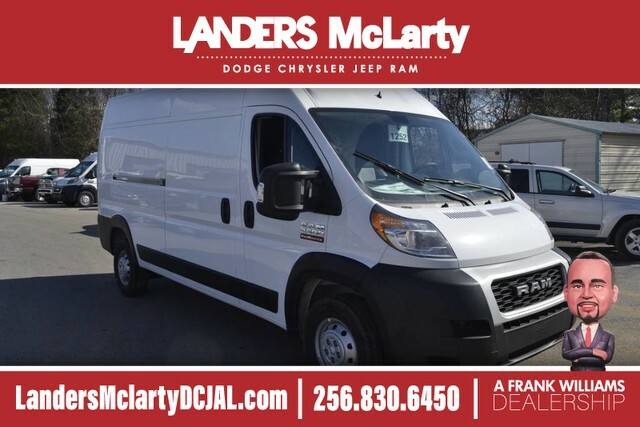 This outstanding example of a 2019 Ram ProMaster Cargo Van is offered by Landers McLarty Huntsville Chrysler. This Ram includes: QUICK ORDER PACKAGE 21A SPEED CONTROL Cruise Control ENGINE: 3.6L V6 24V VVT (STD) V6 Cylinder Engine Gasoline Fuel PARKSENSE REAR PARK ASSIST SYSTEM Rear Parking Aid SIDE WALL PANELING UPPER RADIO: UCONNECT 3 NAV Navigation System AM/FM Stereo Bluetooth Connection WIDE POWER HEATED MIRRORS Integrated Turn Signal Mirrors Power Mirror(s) Heated Mirrors INTERIOR CONVENIENCE GROUP TRANSMISSION: 6-SPEED AUTOMATIC 62TE (STD) Transmission w/Dual Shift Mode A/T 6-Speed A/T MOPAR TRAILER TOW GROUP Tow Hitch 12V REAR AUXILIARY POWER OUTLET DRIVER/PASSENGER 6-WAY ADJUSTABLE LUMBAR SEATS Passenger Adjustable Lumbar Driver Adjustable Lumbar BRIGHT WHITE CLEARCOAT *Note - For third party subscriptions or services, please contact the dealer for more information. * You've found the one you've been looking for. Your dream car. You can finally stop searching... You've found the one you've been looking for. The look is unmistakably Ram, the smooth contours and cutting-edge technology of this Ram ProMaster Cargo Van will definitely turn heads. This Vehicle Does Not Include Tax,Title, And $699 Doc Fee. Landers McLarty Dodge Chrysler Jeep Ram has been serving the Huntsville and surrounding area for over 10 years. We strive daily to provide the best service to every customer every day and invite you to come and experience all we have to offer. We believe in transparent processes and clear communication that allow our dealerships to focus more on what is best for the customer. 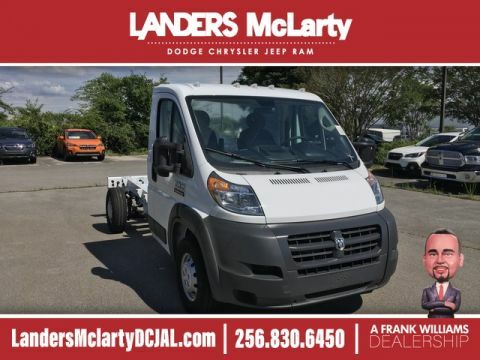 Landers McLarty Dodge Chrysler Jeep Ram	34.747166, -86.691552.